5. 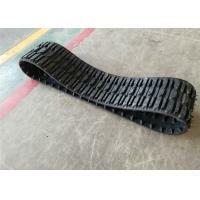 The ground pressure of rubbr tracks equipped machinery can be fairly low, about 0.14-2.30 kg/m2, a major reason for its use on wet and soft terrain. 6. 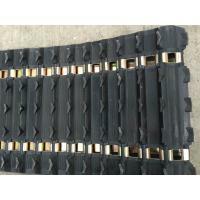 The added traction of rubber tracked vehicles permits them to pull twice the load of wheeled vehicles of the same weight. 7. 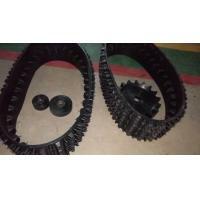 Rubber tracks' pulling performance being twice that of wheels, it permits the lighter vehicles equip with rubber track to do the same pulling work than that of wheeled vehicles. 1. 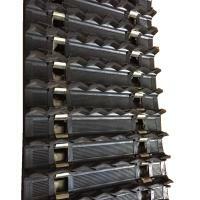 Adjust the tension of the rubber crawler so that the height, the variable range is 10-20mm when the machine is lifted. Readjust when the tension decreases. (Be careful because the rubber crawler may come off if the tension is too low). 2. Avoid projection from the frame around the rubber crawler, especially on its inner circumference. 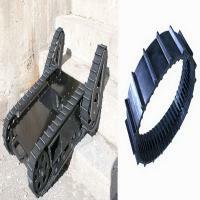 (Rubber crawlers are easily deformed; If it comes into contact with the frame, an accident such the rubber being cut can occur). 4. Avoid turning too fast on concrete roads with a high coefficient of frction because this can cause accidents such as cutting the rubber. Any requirement,please feel free to leave me message.